Is life is a struggle? If any of those sound like you, I want you to know that I can help. But, then again, you don’t have to move forward. No-one is going to force you to let go of that which is holding you back. You are free to continue to live as long as you want, trapped in the past, where your problems and issues rule your entire existence. You can stay like that for as long as you can bear , until it destroys your entire life if you want - you have a choice. ... and take back that life you truly deserve. If you're ready to make that choice get in touch for a free chat and I'll show how I can help. We offer a unique method of pain relief, involving removing the old message of pain by Mind Mediation. It has so far been effective in helping people with: Arthritis, Back Pain, Crumbling Spine, Fibromyalgia, Scars, Post Thrombotic Syndrome and all types of Old injuries. It can also be used to turn off or down Emotional Pain. You can expect a complete removal of pain, or less commonly, a reduction to an acceptable level. 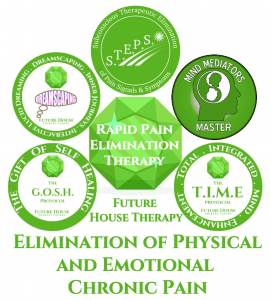 The processes used during sessions for Rapid Pain Elimination Therapy are termed as Mind Mediation. Many issues clients suffer with is due to a conflict between the Conscious and Unconscious mind. I act as a mediator between to two, talking directly to the Unconscious to resolve these conflicts. This is done using a variety of techniques, such as S.T.E.P.S., Dreamscaping, T.I.M.E. etc. Future House Therapy Skills Academy offers world class training, with a dedicated centre in the Chesterfield, and offering most training events via zoom globally. We train practitioners in individual disciplines, such as S.T.E.P.S., Dreamscaping and T.I.M.E. Protocols, as well as a full diploma in Mind Mediation. We also offer membership programs for practitioners to become part of the global brand and receive ongoing training and support for life.